Hi, im playing shining force EXA and using savestate the whole time I cannot save because it says in game "Memory Card Formatting Failed". 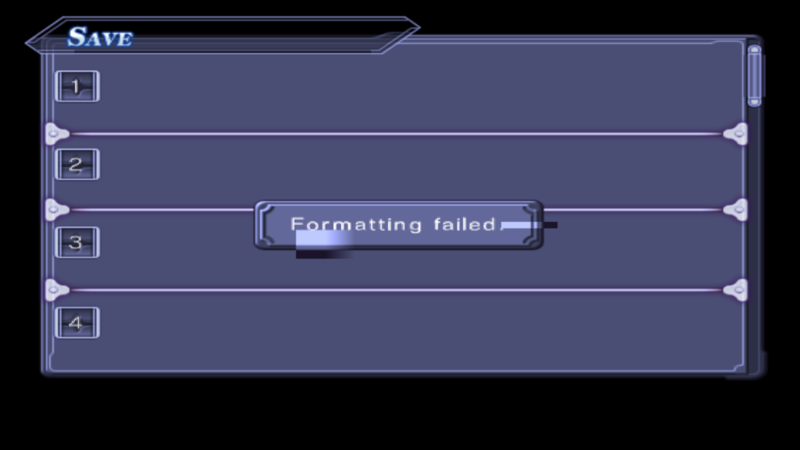 My problem is in order to proceed to post-game, I need to save in game in my savestate but it says formatting failed. this is the kind of problem you should have ruled out before going further in the game. you can still try formatting your memcard through bios, like you would do on your real PS2 console, then try again using your savestate to load your progress. Can't he remove the .mcd file and let pcsx2 remake it? 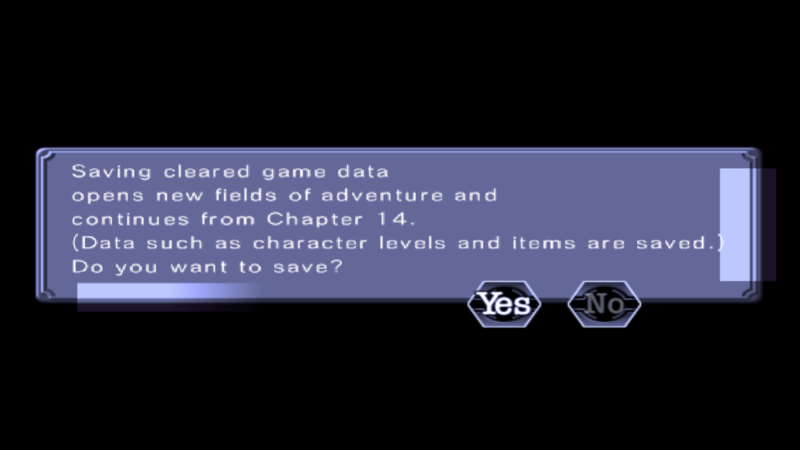 Thought the emulator auto-formatted memory cards. (02-14-2019, 01:13 PM)StriFe Wrote: Can't he remove the .mcd file and let pcsx2 remake it? Thought the emulator auto-formatted memory cards. Nope. PCSX2 on it's own does not contain any formatting routines, and the cards that auto generate are just full of 0xFF bytes (blank). The process is kind of low tech and totally possible, but since BIOS dumps are required and the BIOS has all the routines baked in, why bother? Games will have a higher failure rate at formatting than the BIOS. The BIOS, when told to format a memcard, does the format and calls it a day. Best we can tell the failure rate is near zero this way. Games on the other hand will make a callout to the BIOS telling it to do the format, or possibly take the format into their own hands (yikes). This means the game devs can then program the save screen to advance after a certain signal is thrown out, but since our SIO2 module is definitely not perfect, such a signal may never fire, thus "failing" and abandoning the process. TL;DR echoing jesalvein, do it via the BIOS, it works way better than ingame. It's really simple so that feature would be pointless. 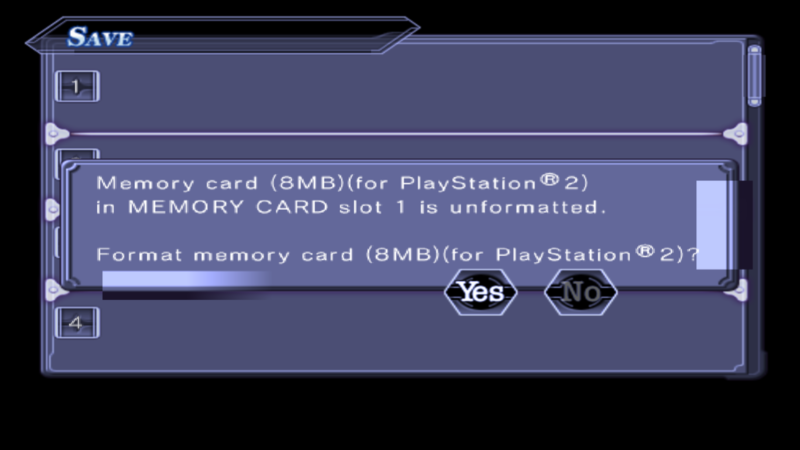 About half of PS2 games, especially newer titles have the ability to format a memory card and the built-in BIOS does it as well. Formatting is a bit more than just a few bytes. The cards are completely blank at first, and formatting creates the superblock (where information about the card's size, cluster size, etc lives), indirect FAT (tells where the FAT lives), the FAT (tells where the directories live), and root directory. Still low tech, but not as easy as just writing a string of bytes once and calling it a day. The format itself, you could say it is "proprietary" cause Sony came up with it and never officially released the spec but that clearly hasn't stopped anyone from reverse engineering it and coming up with their own algorithms for imitating it. Folder memory cards work by creating the superblock but stopping there. The FAT works on the fly and only ever exists in memory, never written to a file. That's why we have to add folder memory card inclusions to the GameDB for certain games to be able to read other game's files. It was intended as a way to prevent running out of space (since the entire principle of folder memcards is not running out of space at 8 or 16 MB) but this is inevitably a side effect of that.